#2030Now – the hashtag for the Sustainable Good Summits taking place around the world – has a sense of urgency about it, doesn’t it. So it should; the long-term has become short term, when we think about major issues such as climate change. 2030 is just around the corner. All our concerns are “now” concerns. Yesterday I was delighted to participate in the Kingston Summit, organized by the U.N. Development Programme (UNDP) office in Jamaica. 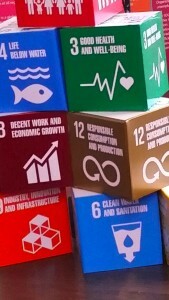 The worldwide Summits are designed to remind us of the Sustainable Development Goals (SDGs) launched just about one year ago – on September 25, 2015. The seventeen goals cover so much ground that it is impossible to encompass them in one morning, of course; but the UNDP took a good shot at it, presenting them through the lens of technology. Getting a “hands on” demonstration of the Pump N Spray from Jovan Evans at the Social Good Summit. Technology is not a goal in itself; it’s a tool. It is already ever-present in our lives, in many different shapes and forms. It is how we use technology to work towards and reach those goals that matters. 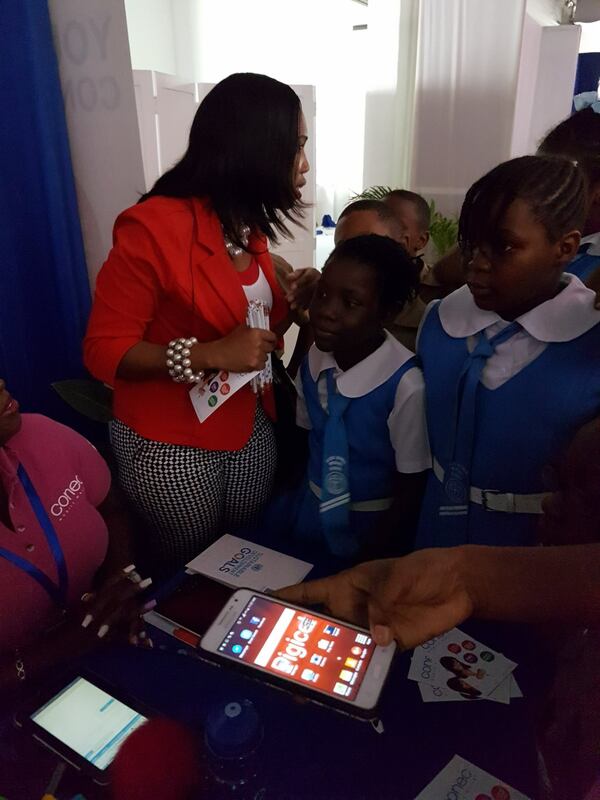 Several innovative entrepreneurs and companies were present at the Summit, with products that find solutions related to specific goals. 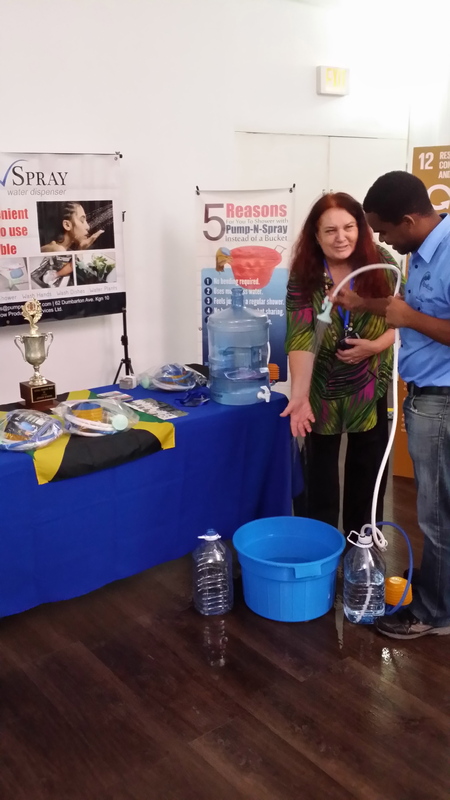 For example, Jovan Evans of Pump N Spray (AquaFlow Products & Services – find them on Facebook) has come up with a foot pump mini-shower invention, preserving water and minimizing waste, especially suitable for drought stricken areas and for when pipes run dry. Simple, and brilliant (and I hope you have patented it, Jovan!) You can read my interview with this young Jamaican on Global Voices, here. 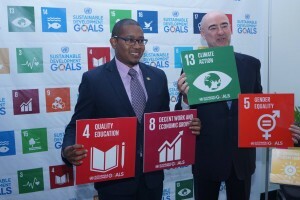 As Richard Lumsden of the Planning Institute of Jamaica (PIOJ) pointed out, the deadline date for nations to live up to the SDGs is 2030. This meshes well with the Government’s own Vision 2030 (which, by the way, you can find online). The Jamaican Government can measure its progress on two parallel lines, which should make things easier. However, rather disconcertingly, Mr. Lumsden pointed out that Jamaica is currently only able to track 25 to 30 per cent of the many indicators laid out for all the SDGs. Countries are tasked with reporting their progress on these indicators annually. However, he did announce that there is a proposal for an SDG Mission to visit Jamaica in 2016. Perhaps this will help get us on track. 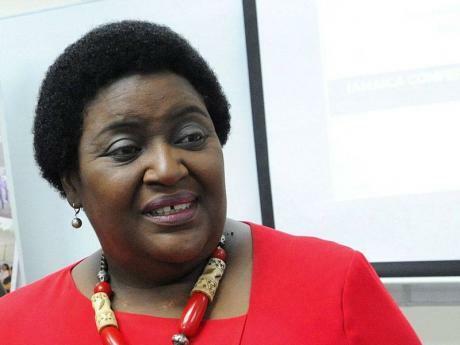 Political Ombudsperson Donna Parchment Brown. By the way, there was mention of an “SDG Working Group” that has already been formed. When an audience member asked about the makeup of this group, PIOJ’s Richard Lumsden said it was entirely public sector – but that “stakeholders” would be consulted. Is it a UN requirement that the working group should be government-only? I’m a little tired of these “consultations,” which are often just a box that has been checked; it’s paying lip service to the people whose lives will be most affected by decisions the Government takes. These “consultations” rarely influence Government actions. What we need is “stakeholders” having a seat at the table. So, in my view, such working groups should include at the very least one youth representative and one civil society representative. 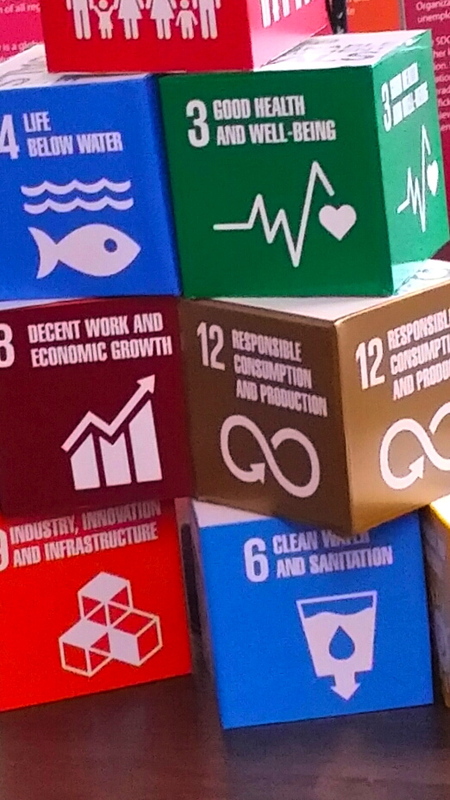 I came away with the sense that Jamaica has “a far way to go” (as head of the Institute of Gender and Development Studies Leith Dunn noted) in reaching any of these global goals. We need to put our feet on the gas, now, and speed things up. We also need to be much more ambitious; for example, Jamaica’s target for renewable energy is to have 20 per cent by the year 2030. This is a very timid target!